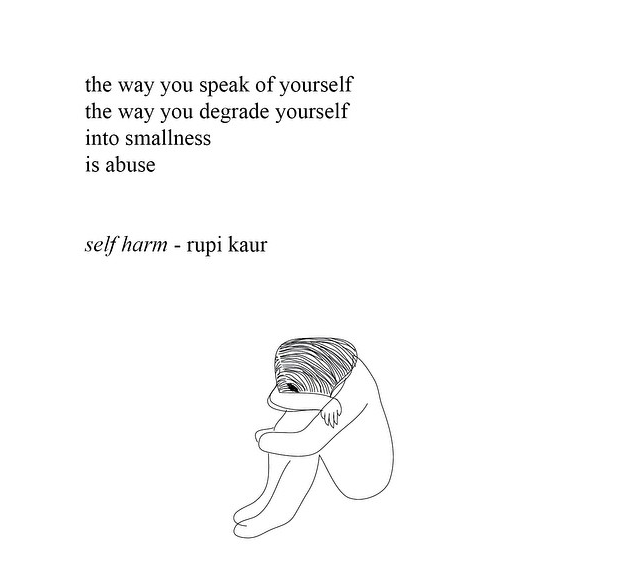 I’m a huge fan of artist Rupi Kaur, whose poem is featured above. If you don’t know her, you should (or you will soon). A writer and an artist, Kaur presents herself and her prose in a form that is perfect for our current consumption. Her poetry, spanning love, loss, feminism and femininity, is perfectly visually suited for our Instagram-obsessed world. She presents her musings in epically relatable pieces primed for sharing online. Many of Kaur’s poems have caught my eye over the past couple months, but the one above in particular struck a chord. Women treat themselves with a vocabulary that is akin to as stated above, self-harm. We put ourselves down in our heads, like an “evil roommate” (Mindy Kaling’s words), who lives with us in a constant dialogue. There is no vocabulary for celebrating ourselves. There are too many factors running against it. It is because of this, or rather, the lack of education on speaking confidently about professional achievement, that I do what I do. I teach women how to brag and self-promote. Confidence around discussing professional achievement gets you ahead. But it’s very hard to do. As it turns out, PR practices are the perfect weapon. Rather, my weapon of choice. I used to run my company as a PR firm. The changing industry landscape and my desire to do something more with what I had learned for over three years prompted me to take all of the PR practices and instead use them to empower people in business. But really, what I saw women doing to themselves, their self-harm in the professional world, had to be addressed. On every level, from intern to executive, women around me were under-cutting themselves verbally when it came to their accomplishments. I saw it in the young women who wanted to intern for me, squirming in their seats when I asked about their experiences. I’ve had women interviewing with me, to my face, call things they’ve done: “dumb”, “unimportant”, “silly”, or “stupid,” and a myriad of other negative qualifiers and self-sabotaging adjectives when asked about their experiences. It didn’t end there. I watched as my peers and friends at networking events, casually alluding to what they did, dismissed the tremendous life-changing and world-changing products and companies they had created or worked on. And then it came in the individuals I represented. I was hired to promote many things as a publicist, but when it came to representing powerful women, I saw this problem at the very top. These women — CEOs, decades of industry experience, Administration roles — did not know how to talk about themselves. Some of this issue is being covered by books and articles aimed at women and girls’ confidence. However, there is no vocabulary of positivity when it comes to talking about yourself in a professional context. This doesn’t only apply to women. It’s hard to promote yourself, period. However, it’s a lot more complicated and socially wrought to be a woman in a public-facing role or in the workplace. There are different standards and more complexities that require an endless handbook of how to be. If women don’t start to speak up, and don’t start being proud of their achievements as it relates the workplace, it will be a loss for everyone. And that will be self-harm. Meredith Fineman is the founder of FinePoint, a leadership company that empowers professionals and leadership through public relations tactics. A large piece of that work is with women and girls, teaching women how to self-promote and brag. Read more of Meredith’s writing here.